Minty fresh breath isn’t just for kids. Share the wealth with your pup. Peppermint (mentha balsamea) may soothe your dog’s nausea and upset stomach, but in large quantities it can also cause liver or kidney problems. 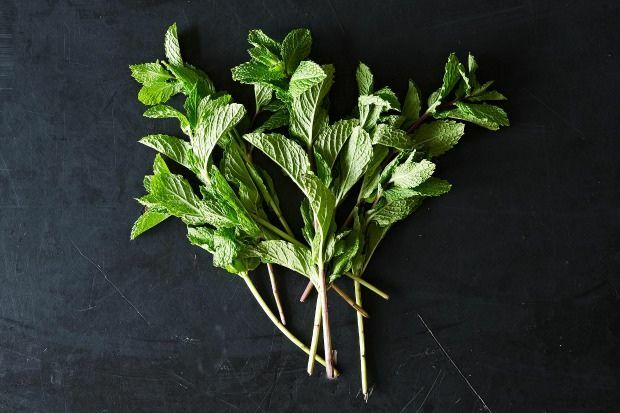 Similarly, spearmint (mentha spicata) can freshen your dog’s breath and repel fleas, but larger doses could cause diarrhea or vomiting, so proper portioning is key. The mint family is diverse, with varieties like lavender mint, apple mint, and even pineapple mint. Just be sure to steer clear of Pennyroyal (mentha pulegium), a type of non-culinary mint that is toxic for both people and pets. The easiest way to add mint to your dog’s diet is to sprinkle a little fresh or dried mint over his food. Just don’t overdo it – a few leaves a day is about all your dog should be getting. While fresh mint can be good for your dog’s health, artificial forms are another story. Breath mints, for example, often contain xylitol, an artificial sweetener that can be toxic for dogs. If you want to give your dog a mint-flavored treat, try your hand at homemade biscuits with a few easy ingredients. Minty fresh thank you kisses to follow.